Earn free books & enjoy new tales with Summer Reading! 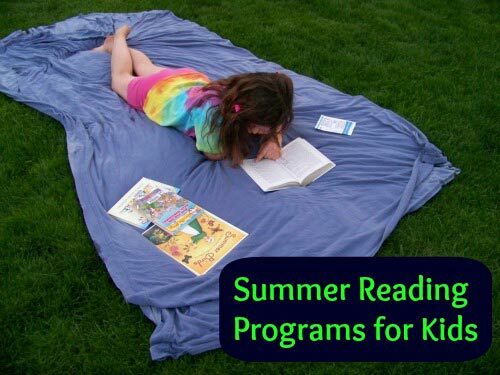 by joining some of these wonderful programs that offer incentives for summer reading. Fancy Nancy, Pete the Cat, DK Readers Lego Legends of Chima, Ramona Quimby, Hoot & Tuesdays at the Castle. Complete selection of books is listed on the reading log. Half Price Books hosts a summer reading program in June and July that encourges kids to read for 15 minutes or more each day! Print off your reading log and record your hours -- once your child reads 300 minutes, they can turn in the log for a Bookworm Bucks! They also have some fun printable booklists and a certificate for the kids too. Open to kids ages 10 and under, Pottery Barn Kids stores offer free summer reading sessions, book logs, a list of recommended books and a chance to win prizes. The program runs May 16th - August 26th and will vary by location so contact your local store for details. Kids ages birth - 12 years old can enter their reading minutes in Scholastic's Read for the World Record challenge. Kids can record their reading minutes online, find book lists, earn prizes and parents or teachers can see how much they read. The program begins May 6th and educators are able to pre-register their students beginning April 8th. Learn more at Scholastic Summer Reading. The American Girls stores will offer some fun activities and events focused on reading this summer. Check out their website for printable activities, great learning guides, details about in-store bookmark crafts and more! Teens (ages 13 - 19 years old) can submit their editorial comments on an article, video, photo or other New York Times post from June 14th - August 16th. Each week, a winning post will be chosen and featured on their blog. Contest rules and details can be found at The Learning Network. Pick up a reading log for Kids & Teens (including read aloud to infants/young children) at your local library. Program runs May 20th - August 3rd with many special events. Online printable activities are also available. Register online or at your local library for listeners (ages 0 - 5), Readers (ages 6 - 10) and Teens (ages 11 - 20). Program begins May 20th and lasts through July 31st. Kids can earn books and Teens can earn Library Bucks which can be redeemed for library services or prizes. Kids can sign-up online or at your local library and Teens have their own program and events. Earn a book, Royals ticket and be entered into prize drawings! Program registration begins June 1st and runs through August 4th. Kansas City Kansas Public Libraries - coming soon! Online registration begins May 14th or you can register at the library beginning June 1st. Kids and Teens can read books to earn prizes, along with attending programs and activites throughout the summer. Summer reading program and events kick-off May 22nd for Kids & Teens. Kids can earn a free book. Teens can also earn additional incentives. Pick up your reading folder at your local library. Reading logs are due back before August 11th. Passport for Summer Reading begins June 1st - pick up a reading log and attend some great programs! The Read Around the World programs will end August 16th. Keep your kids engaged this summer! * Half Price Books, the Half Price Books logo, and "Different Stores. Different Stories." are trademarks of Half Price Books, Records, Magazines, Incorporated, registered in the United States of America. The Half Price Books, DeleteCensorship.org & B(eco)me logos are trademarks of Half Price Books, Records, Magazines, Incorporated, used with permission.